The swimming lake / beach's average water temperature during the summer season is 68 °F. The swimming lake / beach is normally warmest during July with an average water temperature of 68 °F. 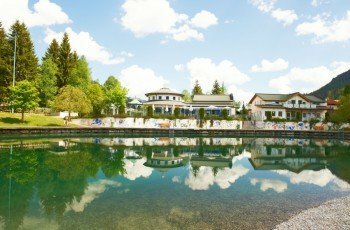 See the currently warmest Swimming Lakes / Beaches in Austria. This destination has got you covered providing a kids’ playground and a water slide. The natural lake with a total surface of 6,700m² (8000 sq yd), containing 17,000m³ (22,200 cubic yd) of best spring water, offers especially families with kids a possibility to relax and have fun. Here one can fully enjoy the summer and use the time, for example, for sunbathing. The lake opens at 9am. The entrance fee is about € 4.50 per person. The lake offers many leisure facilities: A recreation park with a lighted path to walk along, wooden sunbeds, a lighted water fountain, a 3 metre high trampoline, a water slide, and a restaurant. The trampoline as well as the water slide are fun to use, not only for children. For the smaller ones there is an extra playground provided with a toy-castle to jump and climb on. Additionally, you will find a beach volleyball court and an ice tower on-site. The lake itself is located in St. Martin. Follow the road signs towards St. Martin am Tennengebirge.